A lumbar laminectomy is an operation performed to decompress trapped nerves in the lumbar spine causing back pain and sciatica, or neurogenic claudication ( painful and numb legs on walking). 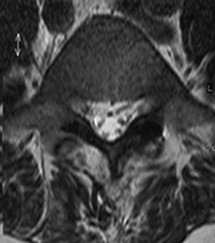 The pictures below show the diagram and MRI scan of a normal lumbar spine, and then a patient suffering with lumbar stenosis. It is hopefully clear that the canal where the nerves run in the upper images ( white fluid with darker dots equating to nerves), is pinched tightly in the lower images, largely due to overgrowth of the facet joints and thickening of the yellow ligament. The operation is performed to take pressure off the nerves trapped in the spinal canal (laminectomy) and as the nerves leave the spine to go to the legs (foraminotomy). My own preference is to perform an operation called an ‘intersegmental decompression.’ This allows a smaller incision to be made on the back, and a more limited removal of the bone is performed, yet the nerves are still decompressed. The operation is performed using a microscope, and the nerves are decompressed by removing the bone and ligament trapping them using a very small drill, and special instruments to remove small pieces of bone. 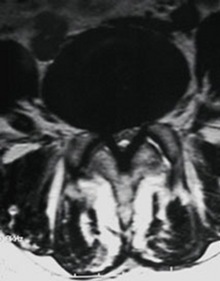 Occasionally, in cases of large disc prolapse, a laminectomy, rather than a microdiscectomy approach is needed to be able to remove the disc safely. You will be lying on your front during the surgery. You will be lying in a special mattress which protects your skin, and your head supported in a jelly ring. In order to get to the spine the muscle attached to the spine has to be separated from the bone of the spine. 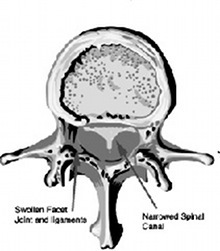 The image to the right shows the extent of bone removal during a laminectomy operation. The red shaded area is the area of bone and yellow ligament that will be removed during surgery. Once the bone of the spinous process and lamina is exposed, this bone is removed using bone cutting instruments together with the ‘yellow’ ligament that passes from the laminae above and below. The dura is the fibrous covering of the nerves in the spinal canal, and all attempts are made to remove the bone and ligament whilst avoiding tearing this layer. Once the spinal canal has been decompressed the microscope may be used to aid removal of bone around the nerve roots as they leave the spine to go to the legs. At the end of the operation a drain may be left at the site of the operation. This is a thin silicone tube which allows drainage of any blood that collects in the wound into a plastic bottle, the drain is usually removed 24hrs after the operation. The wound is closed with stitches that absorb over time, and the skin often close with buried dissolving stitches and paper stitches. 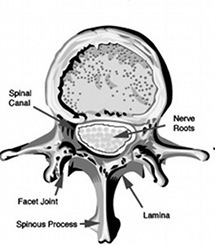 This website by spine-health in The USA has a useful illustrative video explaining laminectomy that may be worth looking at. Generally patients recover quickly from this operation. Because the operation involves stripping an area of muscle from the spine, the commonest problem is low back pain and stiffness after surgery. This may limit your walking immediately after surgery, however we encourage patients to get up as soon as you are comfortable, preferably the same afternoon or the morning after surgery. This pain tends to be well controlled with painkilling medication such as ibuprofen, or a morphine-based medication. The morning after your operation (or even sooner if you feel up to it) you will be encouraged to walk and use the bathroom with staff supervision, a physiotherapist will see you and supervise your mobilisation. Most patients will stay in hospital for 24-48 hours.